Researchers and relatives have encountered difficulties in trying to locate where individual RAMC personnel served during the Great War. This is because many documents state they served with the RAMC and not the medical unit within the RAMC they served in. Through my late father, Reginald Leonard Barrett-Cross's research I have discovered that it is possible to link men with their unit but details are scattered between a variety of information sources, this includes unit and personal war diaries, Absent Voters Lists, members lists and nominal rolls to name a few. The aim of this site is to pull the information together into one place and build a comprehensive list so that research can become easier. It is also intended to be one place where they are commemorated together as a Corps. 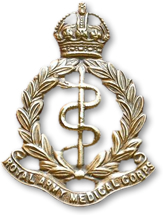 The Medical Services Official History reveals that 66,139 men had been obtained for the RAMC by the 31st December 1915 (excluding Territorial Force) alone. Many men would have been in the home hospital reserve, serving in hospitals in the United Kingdom so would not have served abroad and are much harder to trace. The enormous recruitment of men, the various different medical units and the fact that this project is voluntary and fitted around the usual daily activities, means that the project will be on-going for a long time to come. If you have any information that you believe will help the project, or if your relative is not listed but you have information and would like to see them commemorated, then please feel free to contact me. If you are struggling to find any information then I am happy to help if I can, however it may be quicker for you to check the "Research Help" page, which lists the research sources so that you find the information yourself. I am a member of the RAMC Association but not a member of the Corps and this project is privately funded. If you have any queries relating to the RAMC in general then please contact them directly. All information provided to this project will be credited to the researcher and/or family, and information sources will be passed onto the Army Medical Services Museum.